Every profession or trade has its own language which, until you understand it, can make even the most straight-forward ideas seem foreign and complicated. This is absolutely true for the roofing industry. In the hopes of educating our customers and prospects about their roof and roofing, we offer this somewhat abridged dictionary of roofing terms commonly used in our business. Architectural Shingle – an asphalt shingle that creates a dimensional appearance. Beam – A long piece of wood or steel that supports your roof. Cornice – The overhanging part of the roof that sticks out your walls. Coverage – The degree of weather protection offered by a roofing material. Most common are asphalt shingles, wood shakes, metal roof, tile or slate. Decking or Sheathing – Normally plywood which provides a flat surface covering your home. Dormer – A gabled extension protruding from a sloping roof to allow for a framed window. Dormers are essentially the structure around a window that projects from a sloped roof. This structure is set vertically on the roof slope and has its own roof. 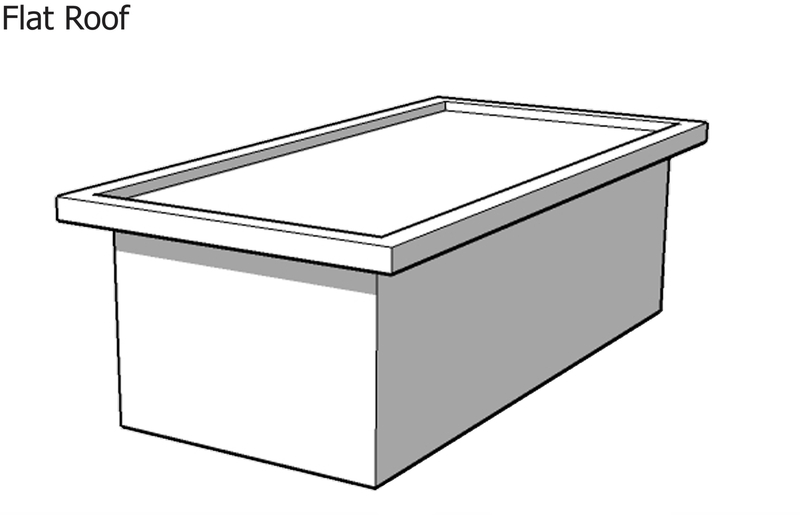 Drainage – Shape, layout and slope of roof for shedding snow and water. Drip Edge – A metal flashing, plastic, vinyl or other overhanging component, with an outward projecting lower edge, to control dripping water direction and help protect underlying building components. 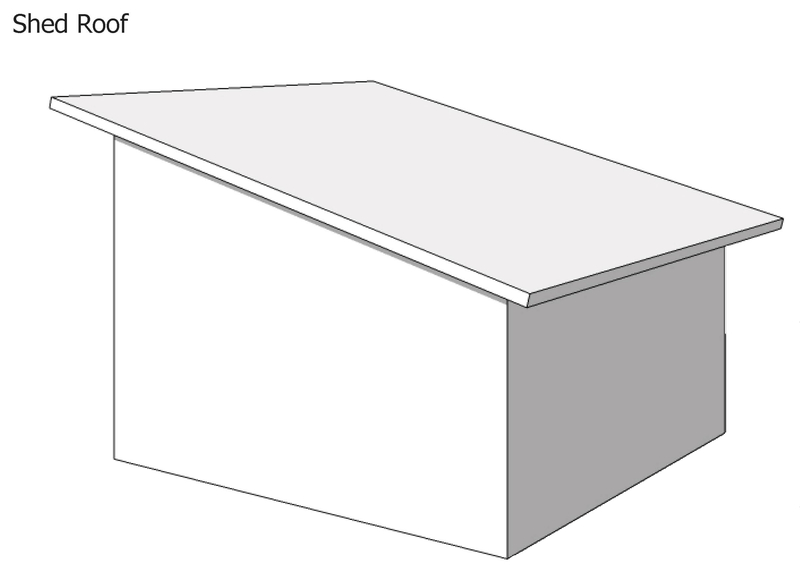 Eaves – Parts of a roof that project beyond or overhang the face of the wall at the lower edge of the roof. Eaves protect the siding and windows of buildings and assure that rain or snowmelt will run off the roof away from the building foundation. Exposure – Specifically, exposure to weather. But also used to describe exposure to the direction of the sun rising and setting. Fascia – The Fascia is attached below the roof line and connects to the soffit, and often where the gutters are attached to the house. Felt (underlayment) – a building paper of strong, tough base saturated with asphalt primarily used to separate the roof covering from the roof deck, to shed water, and to provide secondary weather protection for the roof area of the building. Flashing – Pieces of metal used to prevent the seepage of water around any intersection or projection in a roof such as vent pipes, chimneys, valleys and the joints at vertical walls. Frieze Board – A board at the top of the house’s siding, forming a corner with the soffit. Gable – The end wall of a building which comes to a triangular point under a sloping roof; also a type of roof. 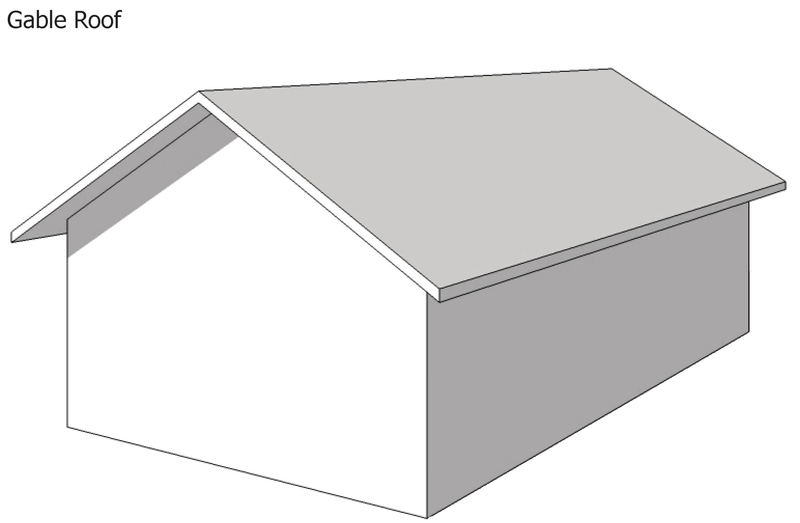 Gambrel Roof – a roof that has two pitches on each side. Hip – An external angle formed by the meeting of two sloping ends of the roof, from the ridge to the eaves; also a type of roof. Louvers – Slatted devices installed in a gable or soffit (the underside of eaves) to ventilate the space below a roof deck and equalize air temperature and moisture. Mansard Roof – a steeper roof that terminates into a flat roof at its high point. Pipe Vent – A vertical pipe of relatively small dimensions which protrudes through a roof to provide gas ventilation. Common Rafters – These beams extend at right angles from the plate to the roof ridge. They are used as the basis for laying out other rafter types. 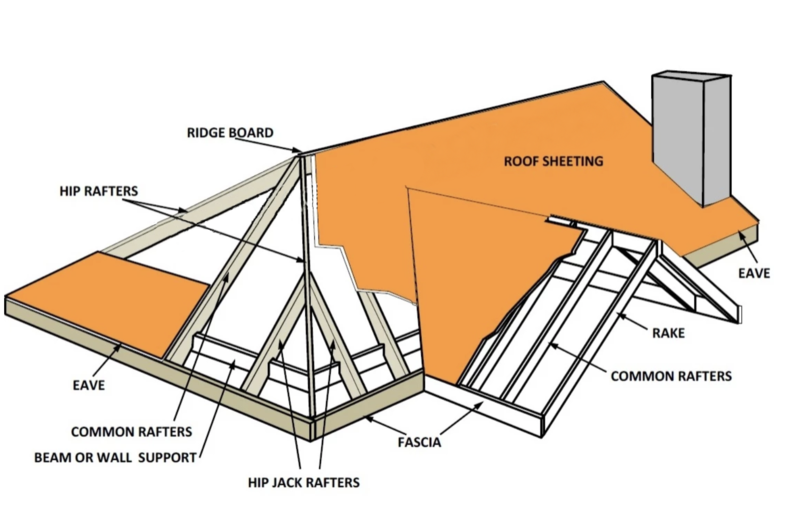 Hip Rafters – The roof beams that extend from the corner of the plate to the ridge. Valley Rafters – The roof beams extended from the plate to the ridge along with intersection between two roofs. Penetrations – Vents, pipes, stacks or chimneys; anything that penetrates a roof. Rake – The inclined edge of a pitched roof over an end wall. 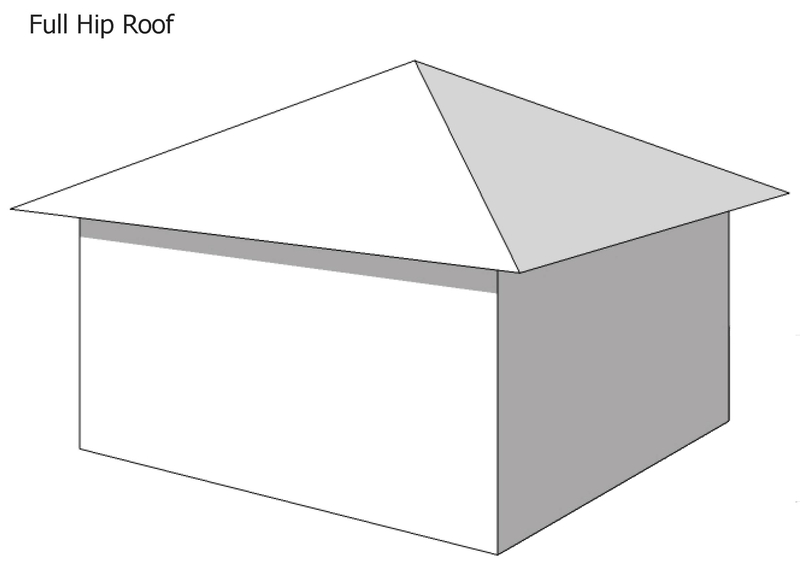 ​Ridge – It is the highest point of the roof that runs the length of the roof; the ridge is where the sides meet to form an angle and must be covered with a ridge cap to prevent water from penetrating into the attic. 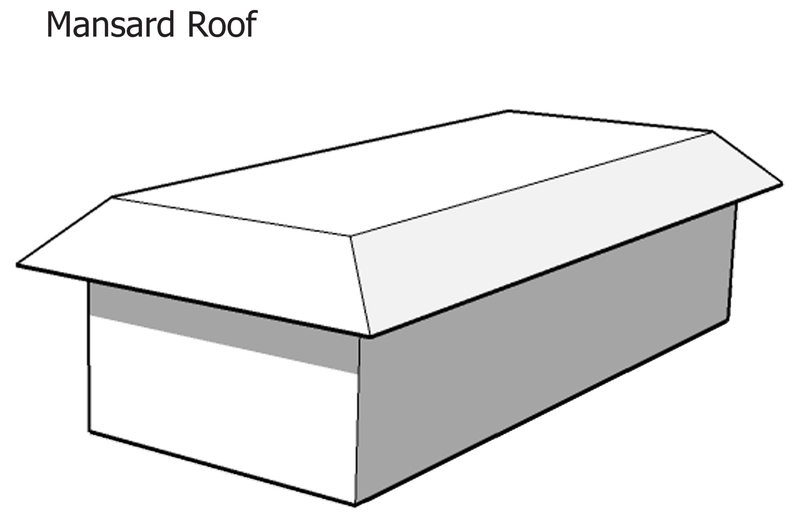 Ridge Vents (also referred to as vented ridge caps) – these are often installed to help ventilate the attic, and may run the length of the ridge. These vents allow warm air to escape the attic which draws cool air in through vents in the soffit. 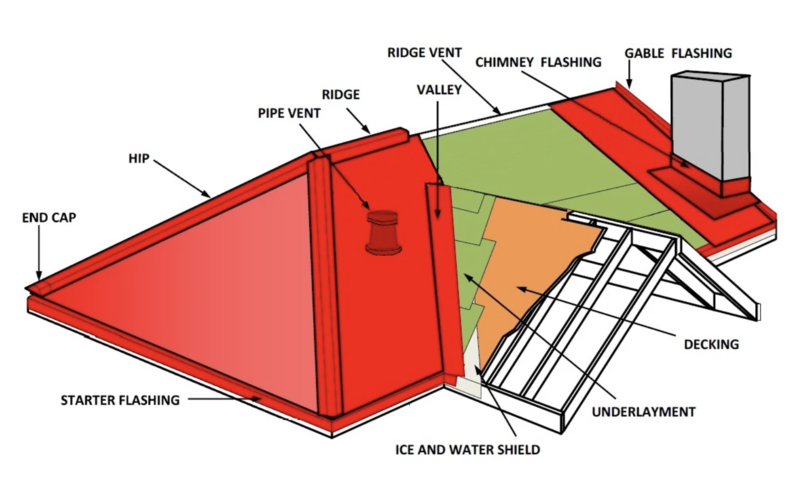 An important part of keeping the attic temperature nearer the outside temperature, ridge vents help protect against moisture buildup and ice dams. Slope – Is the measure of how “Steep” a roof is. 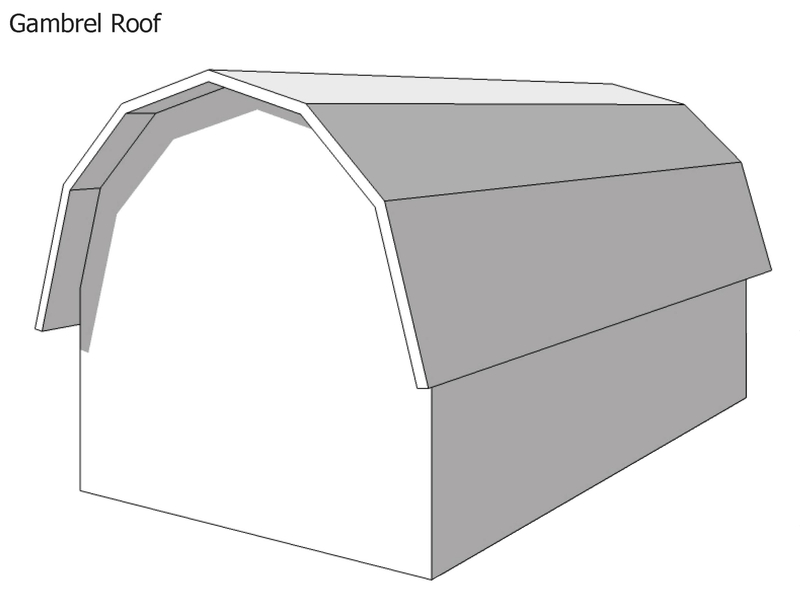 For example, if a roof is “4 on 12″, the roof rises 4 inches for every 12 inches of horizontal run. The slope (or pitch) of the roof is a factor in determining the kinds of materials that can be used and the longevity of the roof. Usually, a steeper roof (higher pitch) will last longer due to better drainage ability. Soffit – It is the horizontal area under the roof overhang when it has been closed off for a more finished appearance. It covers the area between the end of the eaves and the house. Square – The amount of roofing material required to cover 100 square feet (10′ x 10′) of roof surface. Truss – Engineered components that support rafters in many newer homes and buildings. Usually, trusses are designed for specific applications and cannot be cut or altered. ​Underlayment – A layer of moisture protection between the decking and exterior roof covering; See Felt above. In northern climates, an MFM Ice and Water Shield helps to minimize ice damage problems. Valley – the area where two roof fields join to create an upward angle. Roof Valleys are a very common area of failure in a roof and it is important to take care of the valley(s) of your roof by making sure that branches, dirt, leaves etc. are not allowed to collect as this impedes drainage is impeded. Vent – an opening designed to convey air, heat, water vapor or other gas from inside a building or a building component to the atmosphere. If any of the above terms have created a question or spurred you to learn more, or if you have a term that you are unsure of or would like to know more about – please feel free to contact us. We love talking about roofs and roofing.